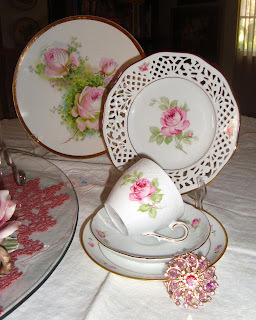 Martha's Favorites: PRETTY IN PINK TEA PARTY! Happy Tea Cup Tuesday No. 167! Hope you are all well. I know that much of the country is having very bad weather and I am so sorry that this horror is happening to you. This weekend in Southern California was prefect pool weather. We all gathered to celebrate my Mother's 81st birthday. She was born the same day my father-in-law, Al was born. My father, was born on the same day my Mother-in-law was born, crazy huh? We only have our Mother and Father-in-law with us now. 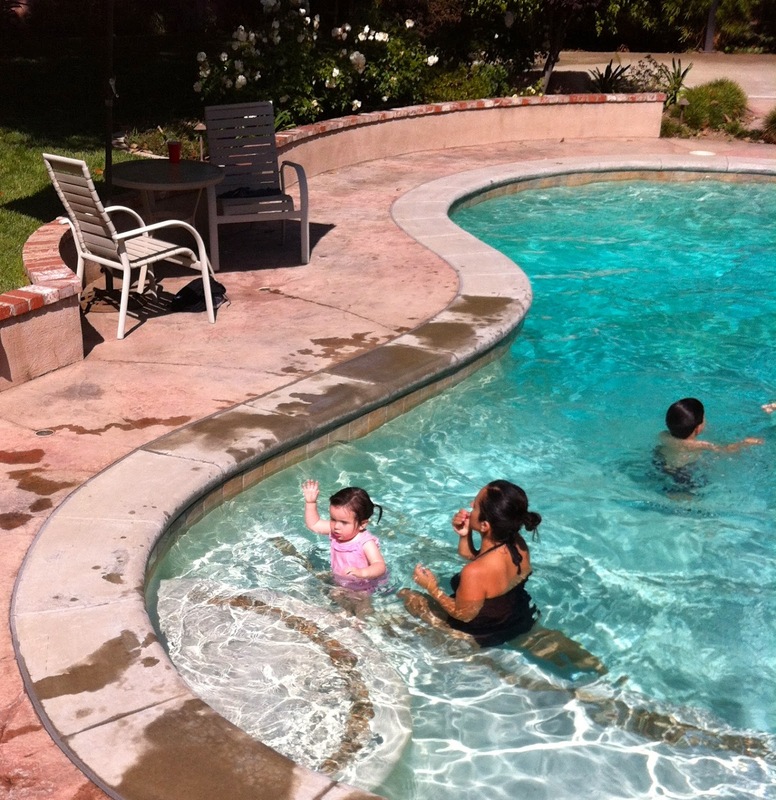 Noah and Sophia are both learning to swim, Noah is almost pool safe, Sophia not so much. This is a picture of my Mother and me, isn't she pretty? She is a sassy little lady and healthy as a horse! My son fought his first fire this past week and he got an offer to work at the Hot Shots, right near our home. He said yes of course, Sunday was his first day at that station. He was traveling to Ojai, California before, this is so much better for him. I am sure you will hear from Terri that we will be having "My Garden Tea Party" these next few weeks. She is getting all the little details together, so don't forget to visit her today. I have to get my spot ready to party. Today I want to start by sharing another teapot. This cute Sadler is very old, but I love the rose design and is one of my favorite teapots to use. I am finished changing my house over to a new color "Pink," so I want to share a pink Shelley with you. Shelley's like Limoges, are in a league of their own. Look at this little tea pot by Artone, England. 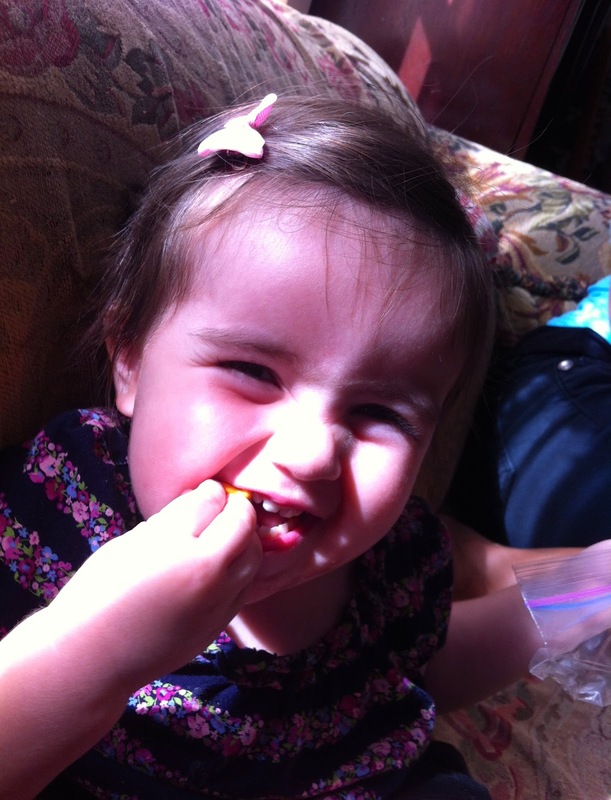 Isn't she the cutest thing you have ever seen? The last cup I want to share with you is a Schumann, Arzberg, Bavaria, Germany. It is a trio, just look at the dessert plate. I love how it looks like lace. All your china today is wonderful. I love that teapot. And that Shelley is my all time favorite! I remember you sharing that once before. It is just the perfect mix of colors to me. Thank you for hosting this lovely tea party! I think your teacups are just beautiful again today - especially the Bavarian trio. I adore pink roses! its so nice to see you with your family. You can be proud about all of them. I also love to see members of your collection. LOL. They are as sweet and in a special manner they belong also to your family, right? Thank you for sharin the blessings of your life and for hosting this sweet party. Good morning Martha, I love your teapot, teacup and the trio is just beautiful. Thanks for hosting and sharing today. Your mother is a beauty. I do believe in soulmates now, we have more than one soulmates, now reading the story of being born the same day, I guess they were brought together for reasons. Your Mom looks so much younger. I think you both have really good skin - lovely! All your tea things are always so beautiful! Hi Martha...Congratulations to your Mama. She looks lovely and is quite a lady. Look at the beautiful daughter she had! Bet your house looks great in my favorite color.....pink! Martha it is always fun to read your postings! 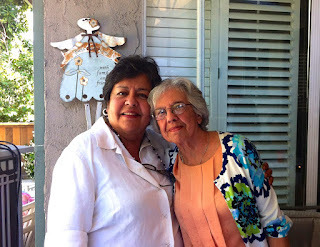 Glad you had a wonderful time with your Mother and she is a lovely lady like you. My mother is 90 and she enjoyed our family visit, especially our two collies, 10 yrs and 5 mths. Your Shelley teacup and saucer is beautiful and it truly is special in it's sheerness. Glad your son's job is closer! Pray for those hit by the storms and the sirens were loud at my hous the night they came through Dallas and destroyed Grandbury, TX homes plus killed 6. Now, Moore, OK has been hit 4 times in 15 years! Thanks for hosting! Hi Martha. Happy Birthday to your mom! Looks like a perfect day for a family pool party! Your china is wonderful , as usual. 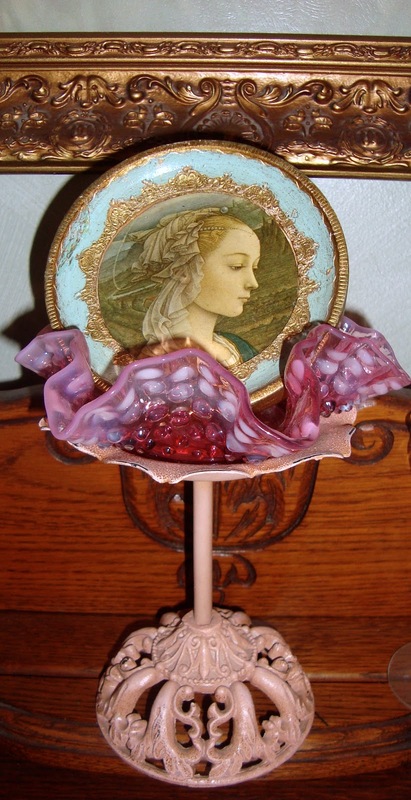 Of course I love the Shelley Dainty Blossom best...I am back from my restorative break. Thanks so much for your kind wishes when I was gone. I have a new address for my blog and Tuesday Cuppa Tea…www.antiquesandteacups.info. Your trio set is pretty, I love plates that have the cutouts to look like lace. 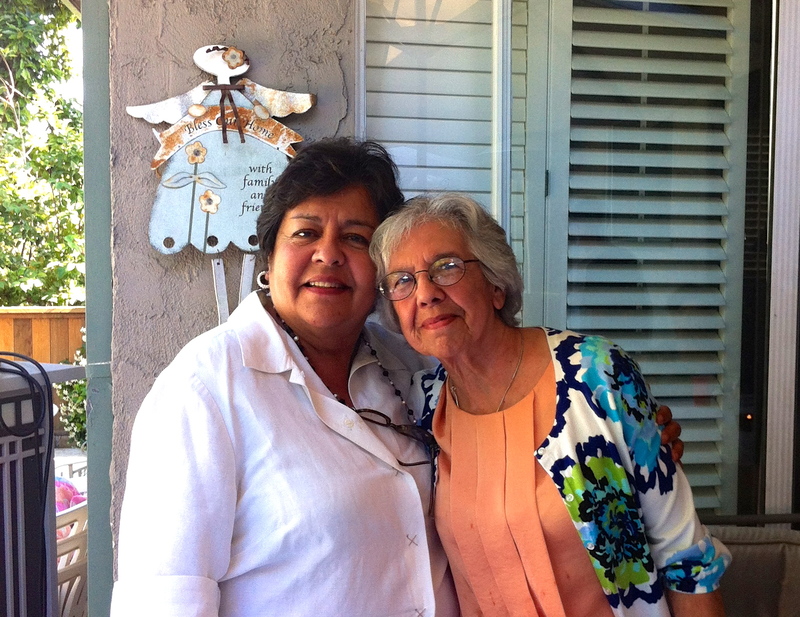 How wonderful to be able to celebrate Mother's Day with your Mom! I feel so grateful and blessed to still have my 93 year old Mom with us. I love all your teacups and teapots! So beautiful! Thank you for hosting and have a wonderful week! A great photo of you and your mother, Martha. And more lovely ones of your little ones. I have never seen a Shelley teacup before, it is rather lovely isn't it? In fact, like Nancy above, I love all your teacups and teapots. Angels to you and your mom! Just wanted to pop by and say hi and let you know that I miss you. We haven't communicated in ages, and that makes me sad! I love the photo of you and your mom. You are both beautiful! Wishing your loved ones a wonderful new year of life! Martha your Shelley china is so lovely ! You are right, Shelley is in a league of it's own and is quite special. I love china from the Victorian times, it isn't quite as valuable as Shelley but I still love it.